This award was created in 1995 and recognizes living retired University of Idaho faculty, staff and/or family members who, in their retirement years, have made significant achievements in volunteerism and leadership to the University. 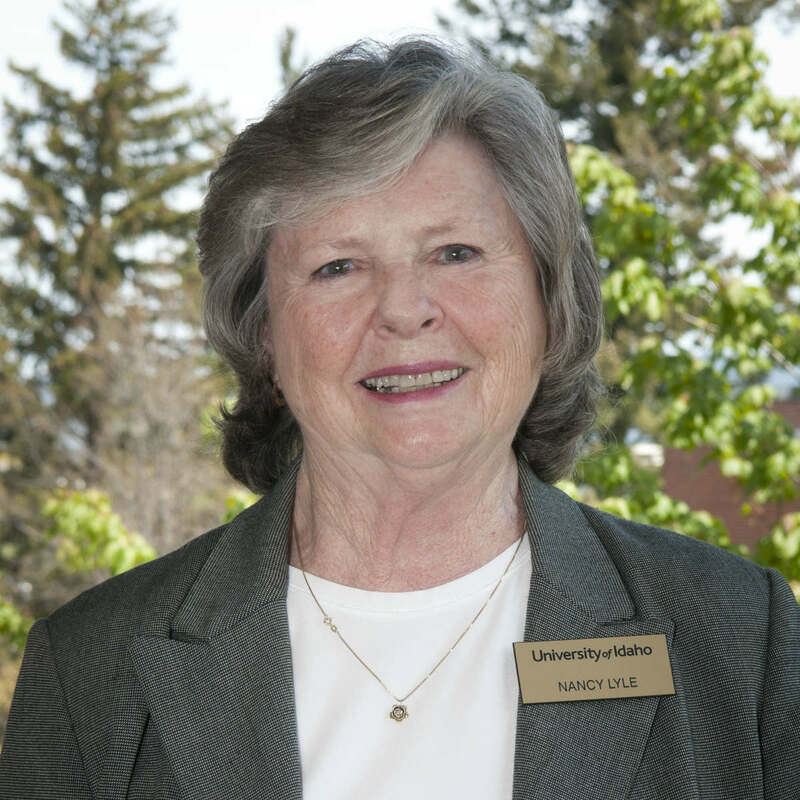 With a personal motto of “do what you can, with all that you can as long as you can” Nancy Lyle ‘56 has served the University of Idaho, city of Moscow, dozens of special interest organizations, friends and family with energy, optimism and selflessness. As the recipient of the Idaho Treasure award, Lyle is a self-proclaimed eternal optimist and a true gem to many. Awarded by the U of I Retirees Association (UIRA), the Idaho Treasure Award recognizes retired university faculty, staff and/or family members who, in their retirement years, have significant achievements in volunteerism and leadership to the university. A native of Moscow, Lyle graduated with a degree in Letters and Science in the pre-med program. As a U of I student, she served as Gem of the Mountains yearbook editor for the 1954 edition, was a member of the Spurs Honor Society and Alpha Phi Sorority where she also served on the corporation board. On top of all that, she was nominated for Homecoming court. After just two years she transferred to use her pre-medical education to train as a nurse. Service to others was something Lyle learned early from her father, Jim Lyle ’29, who was the alumni director for the University of Idaho from 1946 to 1969. As a teen, she volunteered to help her father by addressing and sending alumni communications. Then, after retiring in 1994 from a 37-year nursing career, Lyle made her way back to Moscow from Oregon and found herself volunteering for the Alumni Office once again. That experience turned into a permanent administrative support position from which she retired a second time in 2010. Based on her mother Doris ’29 advice, “It’s better to wear out than rust out,” her list of organizational involvement includes the Campus Cristian Center board of directors, Alpha Phi Corporation board, University of Idaho Alumni Association Board of Directors, Moscow Rotary, Moscow Pleiades Club, the Washington Idaho Symphony, the League of Women Voters, Gritman Medical Center Foundation board of directors, Gritman Auxiliary, Latah Credit Union, Family Promise, Smart Women Smart Money…and the list goes on. Recognition of Lyle and her family’s contributions to U of I can be seen throughout campus, from a Silver and Gold tree dedication plaque outside the Life Sciences building, to the Jim Lyle award she received in 2012 from the U of I Alumni Association. This award — named after her father — is particularly fitting because it recognizes long-term dedication to service to the University of Idaho. Lyle attributes the friendships and life-changing experiences as the reason she gives so much. Her nominators for the Idaho Treasure award praise her dependability and skills in building connections and bringing people together. “I love to work hard and laugh hard,” she said. Based on the list of accomplishments by this Idaho Treasure, Lyle has inspired many others to do the same.